It is almost impossible to describe the city of Canterbury without mentioning the cathedral which actually holds the record for being the oldest cathedral in the whole of England. 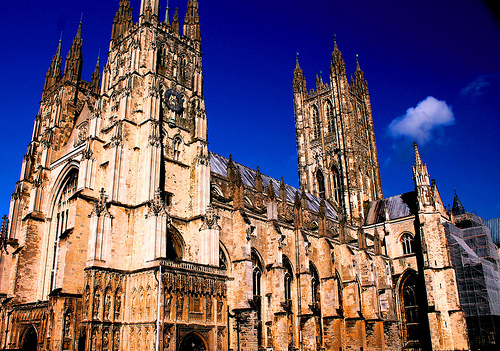 However the story of the cathedral is only part of the history of Canterbury. The city is littered with ancient ruins, some of which, the ruins of St Martin’s Church and St Augustine’s Abbey, are designated a UNESCO World Heritage Site, a site which the cathedral is also a part of. Others like the ruins of the castle are a cold, hard reminder of the history that has made the city what it is today. Despite the strong links to the past that the city retains, Canterbury is very much the vibrant and modern city it needs to be in order to attract the amount if visitors that it does. It is a city that appeals to all ages, from all walks of life. Around the Canterbury area there are beaches that all of the family will enjoy as well as plenty of rolling countryside to explore, giving you plenty of opportunities for picnics and photo shoots. The best way to explore the city streets is on foot, and there are a number of different walking trails that you can follow that will take you around the different sites of the city, details of which are available at all of the tourist information centres. You could choose to find your own way around the city following the trails, or take advantage of one of the many guided tours of the city that are on offer. Lose yourself in the narrow winding streets in the older part of the city or relax and unwind on a boat trip on the Stour River. The views of the city from the river are simply incredible and it gives you a great look at the city’s stunning architecture. Enjoy your river cruise with the swans and other water birds that have made the river their home, among the swaying willows, reed beds and wild flowers. This is a timeless city that offers an insight into the past but also inspires towards the future. Canterbury cathedral has been receiving visitors since medieval times when people would journey to the cathedral on pilgrimage. Now, just as then, all visitors are warmly welcomed within the sacred walls that have stood for centuries. The cathedral features in Chaucer’s famous Canterbury Tales, and was the site where Archbishop Thomas Becket was murdered in 1170. Beneath the cathedral lies the ancient Romanesque crypt which dates back as far as the 11th century, the quire is 12th century Gothic, the perpendicular nave dates from the 14th century and everything is made even more special by the original medieval stained glass which decorates the building with scenes representing the miracles of St Thomas. The cathedral is still very much a focus of the local community and local events as well as national and international events are held here.